The authorities of the self-proclaimed Donetsk People’s Republic (DNR) and the Ukrainian army have reportedly agreed to stop shelling as of 12:30 on Sunday. The authorities of the self-proclaimed Donetsk People’s Republic have clinched a deal with the Ukrainian army to stop shelling each other; the agreement came into force at 12:30 on Sunday, according to Eduard Basurin, a spokesman for DNR’s Defense Ministry. “There was an agreement with the Ukrainian side to halt shelling from 12:30,” Basurin was quoted as saying by local media outlets. Fighting occurred between regular units of the Ukrainian Armed Forces yesterday in Avdeyevka, in the Donetsk oblast. This was reported by the Donetsk People’s Republic (DNR) Ministry of Defense Corps, Deputy Commander Edward Basurin. “We have documented evidence of an exacerbation of confrontation not only between the regular army and the Ukrainian Volunteer Battalions, but also skirmishes between units of the UAF,” explained Basurin. The Deputy Commander said this before reports that the 93rd mechanized brigade of the UAF required the rogue volunteer battalion ‘OUN’ (Organization of Ukrainian Nationalists) to leave their positions near Peski. “And today, April 11, in Avdeyevka there has been fighting between regular units,” said Basurin. 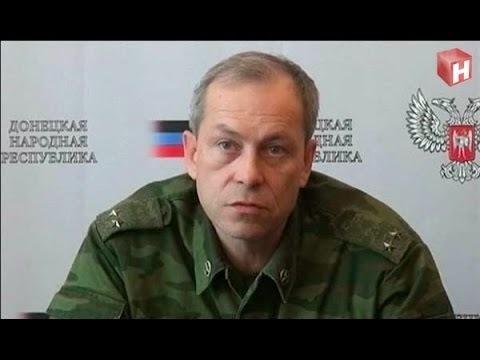 “Please note that these facts of Ukrainian units firing at each other, are presented to the Ukrainian authorities as a violation of the ceasefire by the DNR militia, as regularly reported in the OSCE and Ukraine controlled media,” – said the representative of the military department DNR . The leadership of the armed forces of Ukraine had decided, at the end of the day, to take the Volunteer Battalion ‘OUN’ from the line of contact (ceasefire line) in Peski. 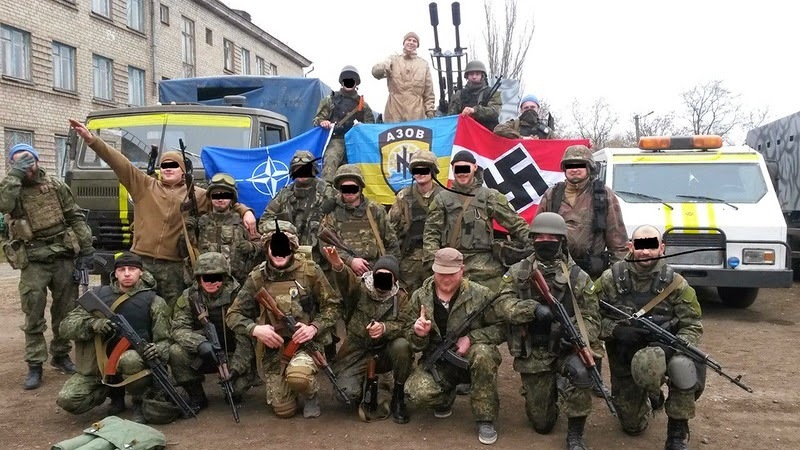 “By staying on the front line, the Volunteer Battalion of the OUN, which is not officially part of the armed forces, did not allow Ukraine to fully implement the Minsk agreement”- said in a statement posted on the UAF website. 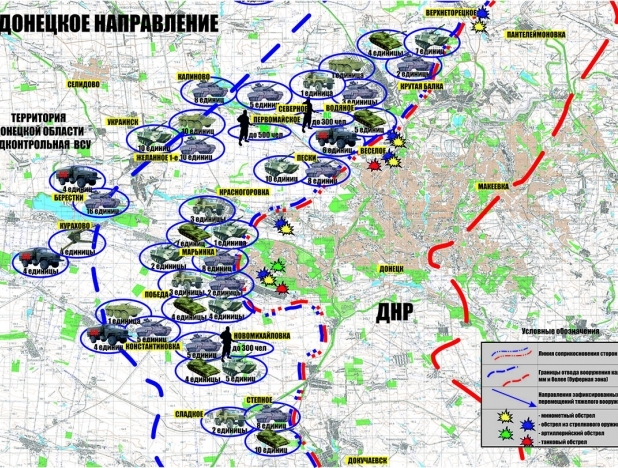 The ceasefire officially came into effect in Donbass on February 14, 2015 at 01:00 in Donetsk. The DNR has repeatedly stated that compliance with the truce depends entirely on the Ukrainian side. As reports claim, yesterday, on April 11th, on the eve of the biggest Orthodox Christian holiday – Easter – “Tochka-U” ballistic rocket was launched on Donetsk by Ukrainian military. As a result in several districts of the city a shock wave as felt. Several sources say the missile blew up at the height of approximately 1200 meters. Whether it was hit by the anti-aircraft forces of the Republic or exploded because it was out-of-date is still not known. 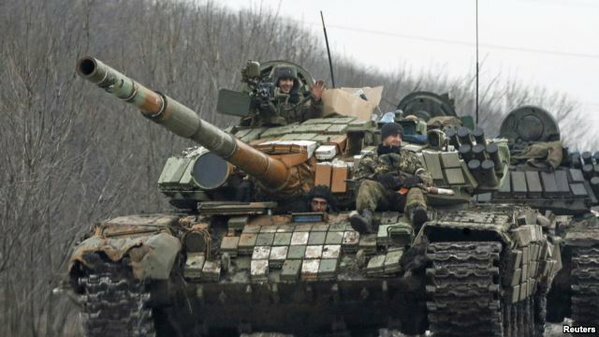 Ukrainian security force tanks attempted to break through the DPR defenses at Donetsk airport, Deputy Commander of the Defense Ministry of the DPR, Edward Basurin, told reporters. “Last night near the village Zhobunki, located in the vicinity of the airport, tanks tried to break the line ” – confirmed the commander. Earlier it had been reported that the village of Zhobunki was attacked at night by Ukrainian infantry, which was successfully repulsed the militia. 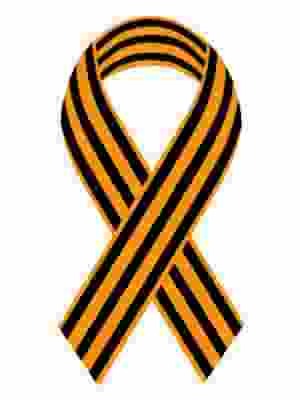 “The towns of Shirokino and Spartak were shelled the most “, said the representative of the Ministry of Defense. Earlier today, the DPR Ministry of Defense noted an increase in the intensity of provocation from the Ukrainian security forces at the line of contact (ceasefire line), including attacks and attempts to break through. 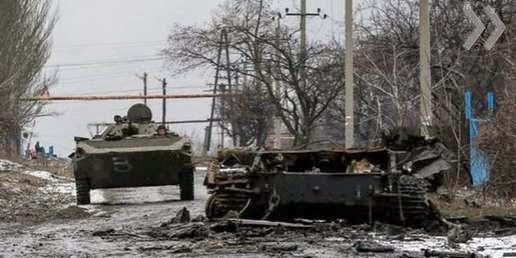 A clash between Ukrainian military and the DPR Army took place in the night from April 12 in the area of the Donetsk airport, reported the Ministry of Defense of the DPR today. “The mine hit a private house, There are no casualties. The shell as launched from the positions of Ukrainian forces. Experts are conducting investigation on the scene”, the Ministry of Defense reports. Earlier it was reported that a mine hit a residential building today at about 7:30 AM in Azotnyi residential area of Kuybyshevskiy district.